Add extra seating and style to a room with this stationary upholstered chair. 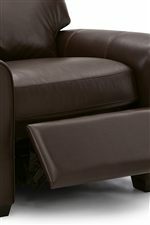 Its smooth sock arms and small wood feet create a transitional, yet chic style, while its premium elastic webbing and high-resiliency foam seat offer durable and consistent cushion and support. Place this chair in the corner of a room or position it gracefully next to your full-length sofa for a quick and easy addition of seating and style. The Magnum Transitional Upholstered Chair with Sock Arms and Wood Feet by Palliser at Reeds Furniture in the Los Angeles, Thousand Oaks, Simi Valley, Agoura Hills, Woodland Hills, California area. Product availability may vary. Contact us for the most current availability on this product. 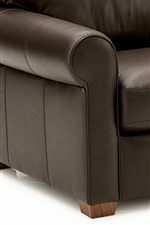 Consistent comfort and sophisticated style go hand-in-hand with the Magnum upholstery collection. A complete ensemble featuring a sofa, loveseat, chair, pushback recliner, sleeper (not shown), and a range of sectional configurations, this collection has everything you need to furnish your formal or casual living areas. Simple yet chic, each piece is marked by smooth sock arms and small wood feet that ooze of transitional style. But where comfort is key, premium elastic webbing and high-resiliency seat foam throughout offer lasting and consistent cushion and support you can't get enough of. The Magnum collection is a great option if you are looking for Transitional furniture in the Los Angeles, Thousand Oaks, Simi Valley, Agoura Hills, Woodland Hills, California area. Browse other items in the Magnum collection from Reeds Furniture in the Los Angeles, Thousand Oaks, Simi Valley, Agoura Hills, Woodland Hills, California area.